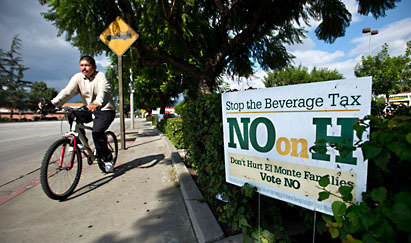 But then the beverage industry converged on El Monte, turning the race into the most expensive campaign in the city’s history — and giving it an increasingly David-versus-Goliath feel. and Louise” advertisements helped derail the Clinton administration’s healthcare legislation in the early 1990s. ….Ads targeting Asians, for example, feature a woman named Stephanie Dang explaining how the tax would hit “boba milk tea.” Ads targeting Latinos show a Mexican American woman talking about chocolate milk….Driving around El Monte last week, [El Monte mayor Andre] Quintero seemed overwhelmed by the opposition. The “No on H” committee has spent close to $1.3 million, compared to his side’s $57,000. The same thing happened in New York, of course, where the 16-ounce rule came only after attempts to levy a tax failed. And it explains a lot of other suboptimal policies too. Why do we have CAFE fuel economy standards for cars, for example? Part of the reason is that a more sensible policy — a carbon tax or a cap-and-trade plan — is politically impossible thanks to the anti-tax jihadists in Washington. So instead we implement a hodgepodge of command-and-control rules that don’t fall foul of Grover Norquist’s blood pledge and which the public accepts because it has no idea that these rules end up costing them more than a simple tax would. In other words, complicated, hidden costs are always better than simple, open costs. That’s always been the case to a certain extent, but it’s become practically a truism over the past couple of decades. Thanks to conservatives, it’s all but impossible to pass a simple, effective policy these days. So instead we get a morass of obscure, convoluted rules that barely get the job done and have a bunch of terrible side effects. And then conservatives complain about how oppressive all our rules are. Pretty nice work if you can get it.